Caney Creek Campground is owned and managed camping facility by the Corp of Engineers. 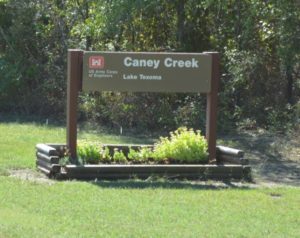 Caney Creek is located on the north side of Lake Texoma in the Cross Timbers Region of Oklahoma just south of Kingston. Directions to the campsites: From Hwy 32 in Kingston, OK, take Donaho Road south and follow signs 6 miles on paved access road to the campground. The campground has 41 campsites with electrical and water hookups and 10 primitive tent sites without hookups. A day-use group picnic shelter with electricity is available. Other amenities include flush and vault toilets, showers, drinking water, and paved access. A boat ramp, dock, small playground and dump station are located on-site. The campground is situated on the shores of Lake Texoma among Post and blackjack oaks which forest the rolling hills where wildlife is abundant. The shoreline is somewhat rocky with only a small area suitable for swimming; parents with small children should exercise caution. October 1st through March 31st: Reduced camping will be available on a first-come, first-served basis (no reservations are accepted). Shower and bathroom facilities will not be open and individual water hookups will only be available through October 31st; after this date campers will need to fill fresh water tanks from the frost free hydrant located near entrance of park. Gate attendants will not be on duty; therefore, camping fees should be paid at the honor vault station. Camping fees will be reduced and are posted at the vault station. Please contact the Lake Texoma Project office at (903) 465-4990 x 0 for additional information.